Business Incubator Gives Funding, Jobs To Vets A new group called VETransfer is helping veterans start their own businesses by connecting entrepreneurs to financing. Many of them hope to later hire other veterans if things go well. "They volunteered to fight for what we have here — and them coming back unemployed isn't fair," one vet says. 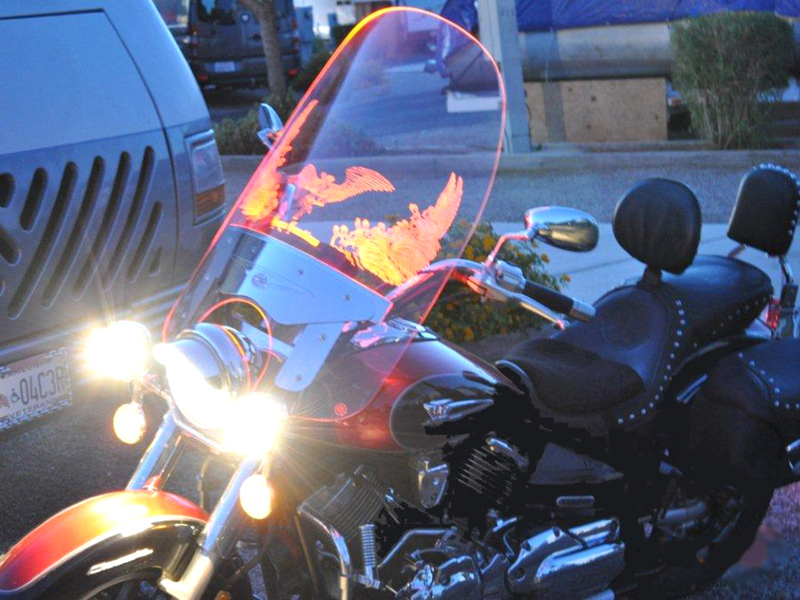 Illumatek makes windshields that are engraved and lit with fiber optics so motorcycles are more visible on the road. Its founder worked with VETransfer, a nonprofit that connects veteran entrepreneurs with funding and business skills. As the U.S. winds down military operations in Iraq and Afghanistan and troops come home, many are eager to start work in the civilian sector. But it's been tough: The federal government reports the unemployment rate for young veterans has hovered around 30 percent this year. Faced with this grim statistic, a new group based in Milwaukee, Wis., called VETransfer is helping veterans start their own businesses. It aims to connect veteran entrepreneurs to financing and equipping them with the resources and knowledge to get their venture off the ground. Marine Corps veteran John Miller is one of those who decided to go into business for himself and is enlisting VETransfer's help to do so. His company, called Illumatek, makes windshields that are engraved and lit with fiber optics so motorcycles are more visible on the road. "I have artists consigned to the company that will draw up anything that they desire, [like] memorials that I've done for people that have lost their sons and daughters in conflicts overseas. I've done pet memorials for people. So it's almost limitless," Miller says. Miller himself rides what you might call a killer Harley. His bike is airbrushed with red and gold flames, and adorned with shiny steel skulls and images of the Grim Reaper. "And that's why on the back it's named 'Straight from Hell' because it looks like it just came from Hell," Miller says. It kind of did. Ten years ago, the bike was totaled and Miller was severely injured in a terrible crash. Unemployment for unemployed veterans aged 18-24 averages 29 percent this year, nearly double the rate for the entire population of that age group. "I got run over on my Harley and then the person that ran me over put their truck in reverse and backed back over me to see what they'd hit," Miller says. "And I decided that I would never have somebody say 'I didn't see you' again." That's when Miller decided to start his own company to make the windshields that allow riders to be more easily seen on the road. He says he's doing great in the motorcycle market, but now wants to reach new customers: people who drive semis, boats and ATVs. So Miller brought his Harley and some demo products to VETransfer, a business incubator located in a former Old Navy store. The space is 15,000 square feet, and has a cafe space for people to sit around or hold meetings in a more informal manner. Ken Myszka is one of five former business executives who received a $3 million grant from the U.S. Department of Veterans Affairs to open and operate VETransfer. "What we're trying to do is, when somebody has a good concept that we think it's going to work and they're truly passionate about doing it, to inject a little bit of money at exactly the right time without all of the strings and hassles that your normal venture capital or that kind of investment would come with," Myszka explains. VETransfer itself doesn't provide financing; rather, it connects clients to investors who are looking to support veteran entrepreneurs. The staff also helps vets with business plans and navigating government regulations, in addition to giving them free Internet access and office space. Myszka says VETransfer has worked with more than 100 veterans in just four months. "We have everybody from a dredger to a photographer to Illumatek, which is a little more high-tech manufacturing," Myszka says. So many kids ... are disabled, so many kids [come] back unemployed and they volunteered to fight for what we have here — and them coming back unemployed isn't fair. Illumatek's John Miller says he's hoping to bring on more than 100 new employees over the next six years and he'd like to hire veterans, especially those who have returned from Iraq and Afghanistan injured or simply cannot find jobs in the civilian world. "We have so many kids that are disabled, so many kids coming back unemployed and they volunteered to fight for what we have here — and them coming back unemployed isn't fair," Miller says. Former Marine A-Sun Truth knows what it's like to struggle in the job market. He's been a repo man, a cab driver and a personal trainer. But now he's hoping the title of entrepreneur will stick with the help of VETransfer. He's preparing to launch a website that will let users exchange tickets and coupons. "What they helped me do is refine my business model and really implement a lean startup strategy," Truth says. "I really appreciate the input from these guys. Like they say, you know, two heads are better than one, and when we get together ... it's phenomenal." Truth says if his business goes well, he'd like to give jobs to fellow veterans — men and women who proved they can work hard. And if VETransfer itself is successful, after two years the VA plans to launch a second business incubator site in the Twin Cities.